This journal presents theoretical, empirical and theoretically-informed articles that explore politics in Europe, the most regionally integrated political and economic environment in the global system. 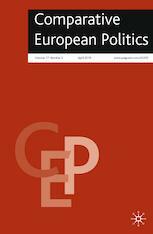 Comparative European Politics (CEP) arises out of a unique editorial partnership linking political scientists in Europe and North America. The journal explores challenging questions about the limitations of existing disciplinary perspectives and theoretical conventions. While promoting interdisciplinarity and a greater dialogue between the various sub-disciplines of European political analysis, Comparative European Politics publishes the best and most original work in the field. Without aligning itself to particular methodologies or theoretical perspectives, the journal publishes substantial articles which explore core empirical developments and theoretical innovation. The journal offers work which develops links between substantive empirical investigations and theoretical elaboration, and which transcends artificial divisions between domestic, comparative, and international analysis. The editors also publish a limited number of debate pieces and review articles related to issues of contemporary theoretical and empirical controversy.